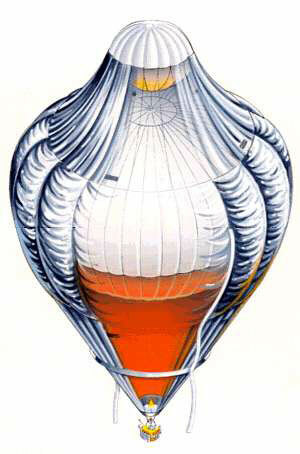 The Rozière balloon (or simply Rozière) is a type of hybrid balloon that has separate chambers for a non-heated lifting gas (such as hydrogen or helium) as well as a heated lifting gas (as used in a hot air balloon or Montgolfière). This type of aircraft takes its name from its creator, Jean-François Pilâtre de Rozier. The advantage of a Rozière is that it allows some control of buoyancy with much less use of fuel than a typical hot air balloon. 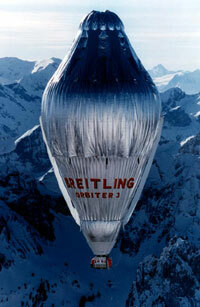 This reduction in fuel consumption has allowed Rozière balloons and their crew to achieve very long flight times, up to several days or even weeks. The first Rozière was built for an attempt at crossing the English Channel on 15 June 1785. The balloon suddenly deflated (without the envelope catching fire) and crashed near Wimereux in the Pas-de-Calais. Today, Rozière designs use non-flammable helium rather than hydrogen. Their primary application is for extremely long duration flights such as the first successful non-stop round the world balloon flights. On February 27, 1999, while they were trying to circumnavigate the world by balloon, Colin Prescot and Andy Elson set a new endurance record after flying in a Rozière combined helium and hot air balloon (the Cable & Wireless balloon) for 233 hours and 55 minutes. Then on 21 March of that year, Bertrand Piccard and Brian Jones became the first to circumnavigate the Earth, in a Rozière known as the Breitling Orbiter 3, in a flight lasting 477 hours, 47 minutes. Their records for time and distance remain unbeaten in any kind of balloon. On 4 July 2002, after five previous attempts, Steve Fossett became the first to achieve a round the world solo flight, while also topping his own solo endurance record, also in a Rozière, the Spirit of Freedom, which used the same envelope as one of his previous attempts as well as for an attempt by another team. Great article, though it would be helpful to add a description to the pictures. Why is there this mini-balloon at the top of the big balloon? The concept is that the upper part is filled with hydrogen or helium an by heating the gas you will increase the buoyancy. Is the upper mini-balloon designed to provide an air-cushion against the cool outside-air? This would make sense.